5 Interesting Ways to Monetize Your Website | AdsWiki - Ad Network Listing, Reviews, Payment Proof & Advertising News. Unlike pop up ads, or even pop under ads, exit ads help you make the most of your bounce rate. Every blog has some kind of bounce rate – so why not monetize it? Exit ads give users an advertisement when they exit your site. Since bounces aren’t going to stick around long enough to even see your pay per click ads, these unique advertisements can help you make some money no matter what. Don’t saddle yourself solely with advertising that only works on desktop computers. More and more traffic is going mobile, so consider adding mobile-specific advertising to your site. There are lots of ways to do this, but one of the simplest ways is adding a banner ad placement to the bottom of your mobile site. 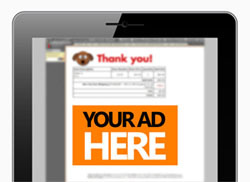 These sticky ads stay placed at the bottom and generate income for you on mobile devices. This can be particularly useful if you see that you’re getting lots of mobile traffic. If you have a mailing list on your website, advertising could be an excellent inclusion that also makes you a little money. Monetizing your email data can help you make the most of a mailing list. Not only are you reaching out to people interested in your website (or at least, interested enough to sign up for your list! ), you can also make a little cash in the process. It’s not a bad deal for companies interested in monetizing their marketing activities. It seems like everybody has an ebook these days, but have you thought about doing it on your own website? Creating an ebook doesn’t have to be a challenge – in fact, you could do it relatively simply. If you’re a great writer, consider taking old blog posts and adding more in-depth examples and content. Turn it into a short ebook guide to the subject area, and sell it on your site. Another option is to hire a ghostwriter and provide them with an outline, then have them help you turn your ideas into words. While this does take some legwork, it can be an excellent way to make a few bucks. Yes, we know Google Reader closed down. But there are still people out there who use feed readers, believe it or not, and they might never even see the advertisements on your blog. Make sure you’re making the most of your amazing content, if you have an RSS feed, by including feed advertisements. You’ll get a bigger number of eyes on these ads, and they’re relatively unobtrusive, so they won’t take away from your content. Putting PPC advertising on your website isn’t the only way to monetize your website. If you’re interested in making money from your online adventures, consider trying out one of these five ways to earn cash through your site. 2 Responses to "5 Interesting Ways to Monetize Your Website"
I love this. I will investigate further. Google and Samsung join forces.